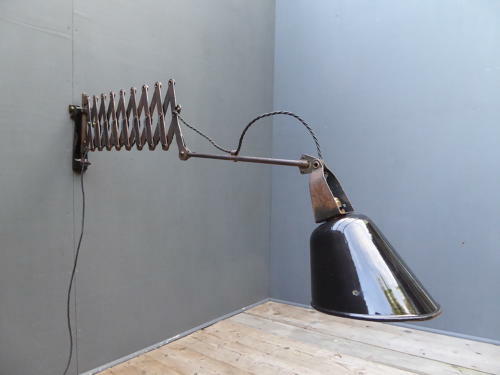 An original vintage industrial Walligraph scissor lamp. A fantastic Walligraph 'Radialite' lamp with exceptional build quality & a great reach. The articulated copper riveted arm extends from a heavy cast iron wall mount & supports its original conical black & white enamel shade. A handsome & beautifully engineered industrial lamp. Wear commensurate with age, good functional condition showing pleasing signs of its industrial past. The shade has somne scratching & chipping to the enamel the framework has a good honest age related patina. Overall reach extends to around 165cm.